Flight-2 Primary Flight Instrument for a great price! The Flight-2 is a ultra compact, complete primary flight system intended as main flight instrument for smaller aircraft or as a backup / secondary flight instrument. 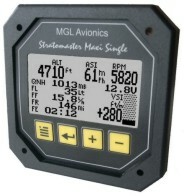 This 3.5" instrument provides many functions from Altimeter, Airspeed to Fuel level/flow, Engine RPM and many secondary functions, including an automatic flight log. The Flight-2's light weight, small size and high level of functionality in addition to excellent value for money make it an ideal choice for many applications. The Flight-2 makes an ideal companion to the Stratomaster E1 universal engine monitor for a compact, low cost yet highly functional and complete cockpit solution.